In the distance, a soaring elevated freeway intersection frames a widescreen view of the San Gabriel mountains. The dissonance is typical of Southern California: awesome nature matched by equally awesome urban development. Despite the seemingly endless sprawl, it is rare in the Los Angeles basin that one cannot see out of it to the wilderness beyond. Down below the traffic lies a quiet industrial development—rows of identical roller-doored units off a street with young trees and clipped lawns. In one of these units John Divola stores the bulk of his archive, which spans ﬁve decades, in metal shelves, with a table and empty walls at the front for viewing work. Two doors down, weightlifters have rented a unit as a gym. To his knowledge, he is the only artist on the block. It is, perhaps, an unlikely place to ﬁnd an artist’s studio. The town of Riverside, where Divola has lived for over a decade and worked since 1988, is situated sixty or so miles east of Los Angeles, in the heart of the Inland Empire. It is a comfortable, suburban place—maybe even a little bland. Divola admits that most of his artist colleagues and students at the University of California Riverside, where he is a distinguished professor, choose to commute from Los Angeles. What brought him to Riverside? Partly, perhaps, the same qualities that he cites for choosing the studio: “Being here is a practical consideration—it’s very inexpensive, convenient, clean, and air conditioned.” I point out that the area is not dissimilar to the San Fernando Valley, which he documented in an eponymous series of photographs from 1971–73, made at the outset of his career. 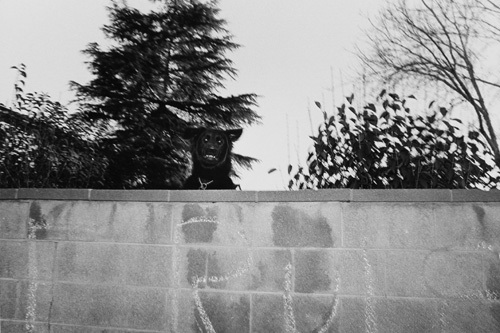 In those images, I suggest, there was a sense of sociopolitical criticality, of the photographer’s estrangement from the outwardly conventional suburban environment in which he had grown up. This widespread misreading of Divola’s position as an artist has dogged him throughout his career, and it has to a great extent shaped his subsequent work. Putting himself in the picture, implicating himself in the situations that he photographs, is for him a central strategy. After the San Fernando Valley series he made Vandalism (1973–75), black-and-white images of derelict houses featuring spray-painted marks that, it becomes clear, were made by Divola himself. He is the vandal—or one of them. In Los Angeles International Airport Noise Abatement Zone (1975) he photographed evidence of forced entry into empty houses marked for demolition. Was it the artist himself who had caused the damage? Additional photographs taken inside some of the houses suggest it probably was. 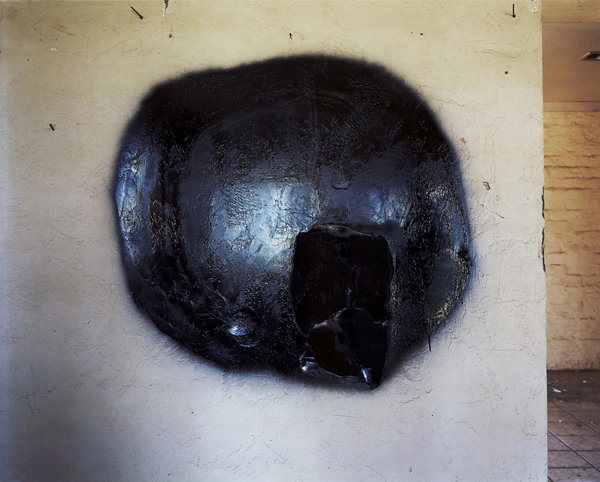 In certain images from his Zuma series (1977–78), shot in an oceanfront house in Malibu, the camera ﬂash pins objects such as a newspaper in midair, thrown into the frame by the unseen photographer. Divola talks about himself as a “specter” haunting his pictures. He feels this especially strongly when he looks back at early photographs and tries to recognize himself in them. Retrospection has occupied him a great deal recently—not least because he is currently preparing for a three museum exhibition in California this October. The Santa Barbara Museum of Art, the Los Angeles County Museum of Art, and the Pomona College Museum of Art will mount coinciding but separate exhibitions of his work, none of which, Divola insists, is a retrospective. He also found himself reﬂecting on his photographs from the 1970s while scanning old prints for his book Three Acts, published by Aperture in 2006. Revisiting these images prompted him to look once again for abandoned houses in which he could make photographs—this time with far more advanced technology. Divola’s Dark Star series, from 2008, was shot largely in an empty house ﬁfteen miles inland from Riverside, at the eastern edge of the megalopolis that stretches all the way to the Paciﬁc Ocean. Large discs of black spray paint recollect the mysterious markings he had made in Vandalism. In the same house, Divola made the more recent series Theodore Street (2008–12) using an ultra-high-resolution method of photography called Gigapan. Between 40 and 120 separate photographs are stitched together by software to make a picture that can be printed at large scale without losing detail. Divola says his early prints are small only because, printed any larger, the raw materiality of his subject—scraps of plywood, shattered glass—would have been overwhelmed by the grain and fuzz of the photograph. In prints up to ﬁve by ten feet, some of which will be shown in Santa Barbara, Divola physically enters the scene and secretes himself among the details. There is plenty of space for the artist to get lost. Divola doesn’t actually make art in his studio. His “indoor practice,” as he calls it, is taken up with managing his archive, the logistical challenges that he likens to Napoleon marching through Russia (“because it’s hard to move forward when you’re looking after the stuff in the rear”). The studio also gives him space to assess prints, old and new, some of which, such as his unﬁnished multipart work Malibu Progressions, from 1984, he is revisiting now that he has large inkjet printers at his disposal. The real work, however, is done out in the ﬁeld. “The beauty of photography, or conventional photography, is that it draws you out into the world, it draws you into an engagement with present reality,” says Divola. And with that, we’re out the door.